How many of you have thought about setting up a beach bar for your retirement? Many dream, but few do. 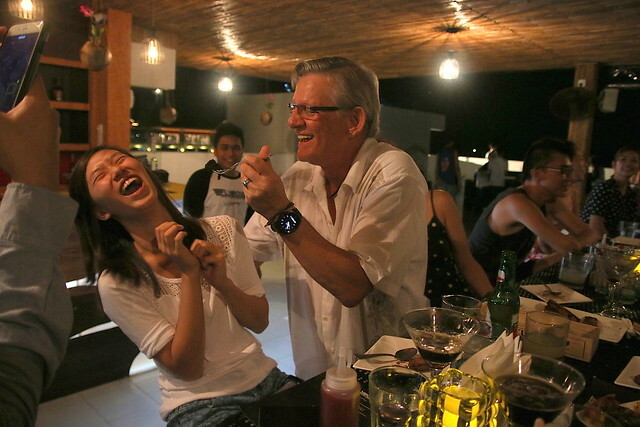 Veteran Singapore entertainers Chris Henson and Mark Van Cuylenberg aka The Flying Dutchman have made it happen. 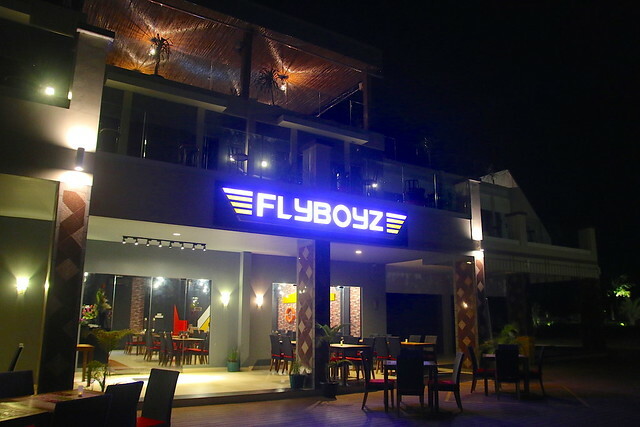 After a few years of planning and looking, they finally built Flyboyz at Lagoi Bay, Bintan. Why Bintan? They fell in love with the beach and the view. I don't blame them. 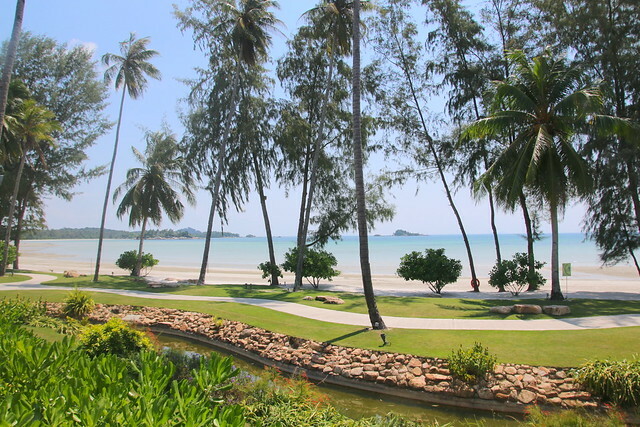 Bintan was also much cheaper than Singapore while being very close. Plus, there's an international airport opening end 2015 here near the ferry terminal. That will bring tourists from Europe and beyond. 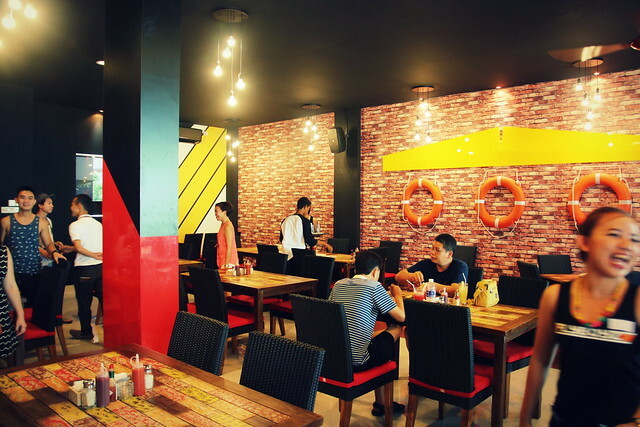 Flyboyz is also one of the first F&B outlets to open at Lagoi Bay. It's right next to Lagoi Plaza and walking distance from the newly opened Swiss Belhotel. Let's take a closer look at the three concepts in Flyboyz - restaurant, retro bar and Cuban open sky lounge. On the ground floor you have a casual diner. It's family-friendly and brightly decorated, with a beach holiday feel. It's Western comfort food in hearty portions - think 450g beef patty burgers and 18-inch pizzas. They were not kidding when they said, "Be hungry, be very hungry!" That's beef bacon in the burger, by the way. No pork and no lard here, but no halal certification either because they serve alcohol. They trained the local staff here to cook. Lots of stuff is made in-house, like the breads and buns, as well as the awesome dried chili flakes. However, the food here still has plenty of room for improvement. Next time I'd skip the pasta and apple pie. The burger looks great but the patty was a little dry and chewy. 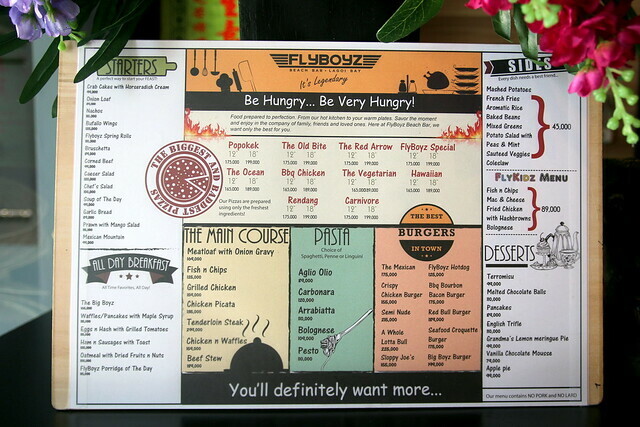 Flyboyz just opened in June, so maybe they need a little more time to tweak the recipes. 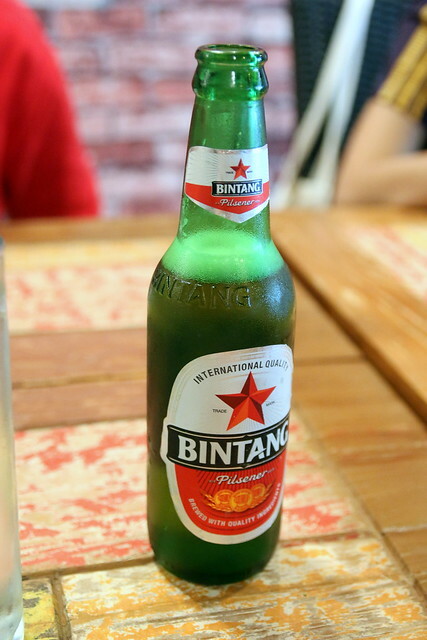 When in Bintan...try the local Bintang beer. But there's also Corona, Heineken and Guinness Stout. If you don't take alcohol, try the mocktails - we liked the Mangrove Madness (left), which actually tasted healthy. It's made from mustard greens. orange juice, pineapple juice, and simple syrup. Apparently it's pretty popular in Lagoi. 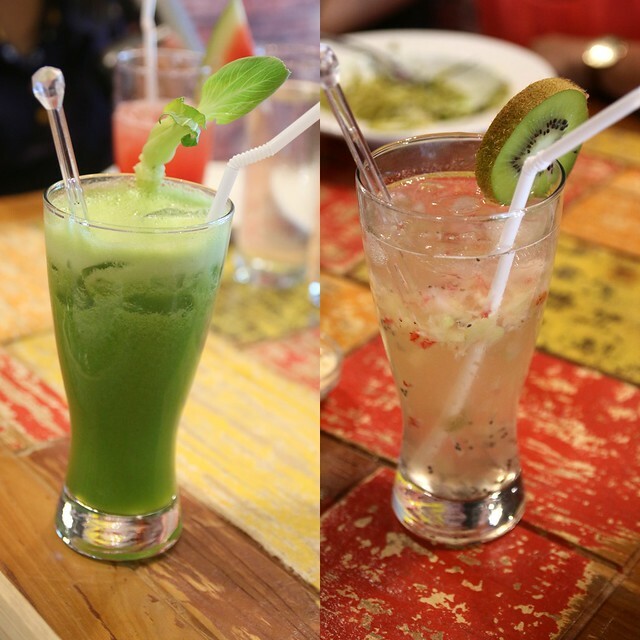 Or you could go for the Ki'st Squash (right): strawberry, kiwi and mint topped with soda. It looks like that one could use more fruit though. 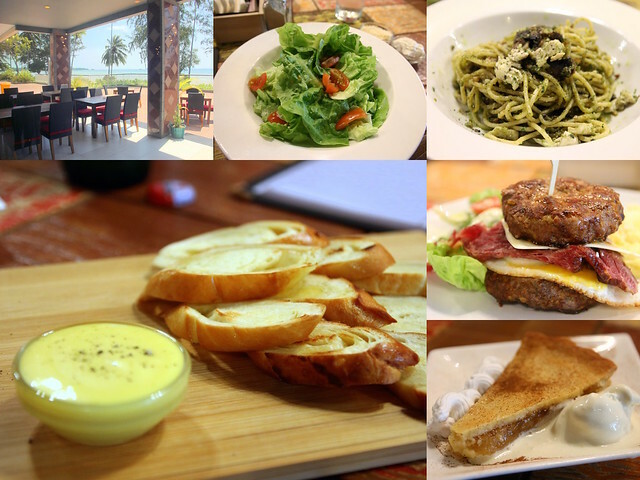 Warm beach, cool drinks, hearty food - elements of a great holiday. The prices though will make you feel you did not leave Singapore. 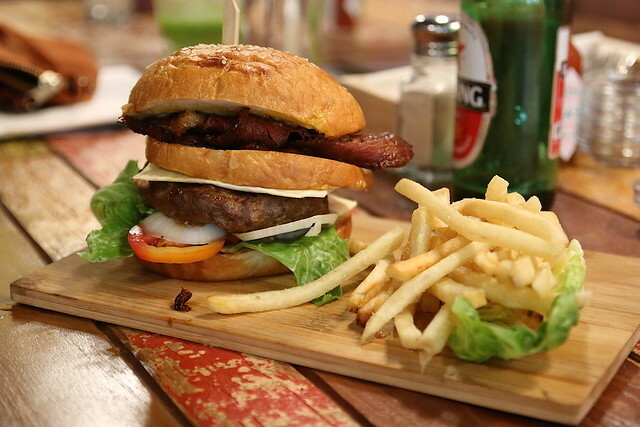 The BigBoyz Burger is Rp199,000 or about S$20. Pizzas are about S$17 (12-inch) to $20 (18-inch). The desserts are about S$10. If you grew up with Queen, AC/DC, Depeche Mode, Bon Jovi, U2, Rolling Stones blasting from your stereo, this place will bring you back to your youth. 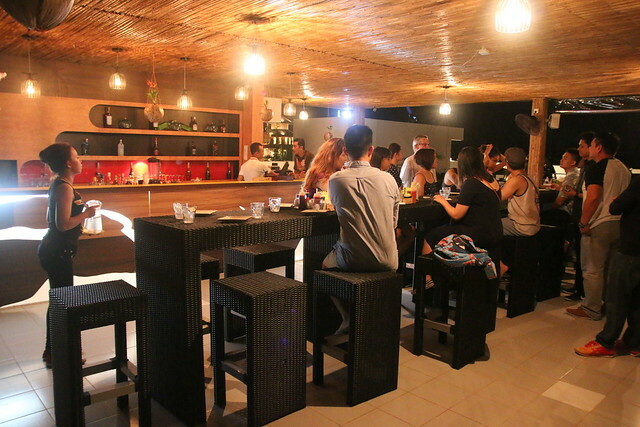 It's retro music from the 70s to early 90s all the way at hoobar on the second floor. Maybe a couple of Top40. 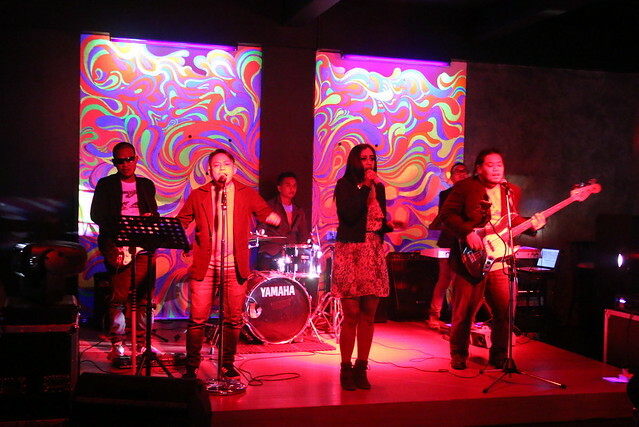 A six-piece resident band plays live music Tuesdays to Sundays. 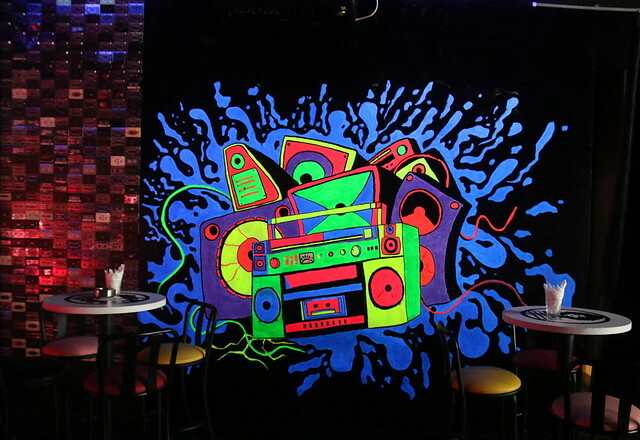 There's neon graffiti painted by the staff, and a wall of cassettes and CD covers as a retro feature. Well, photos can't really give you the full picture, so here's a video of the entertainment going on. If you prefer to dance to a different beat, head upstairs to the sky lounge Cuba where they play lively Cuban jazz and salsa music. Dine, drink and dance under the stars. 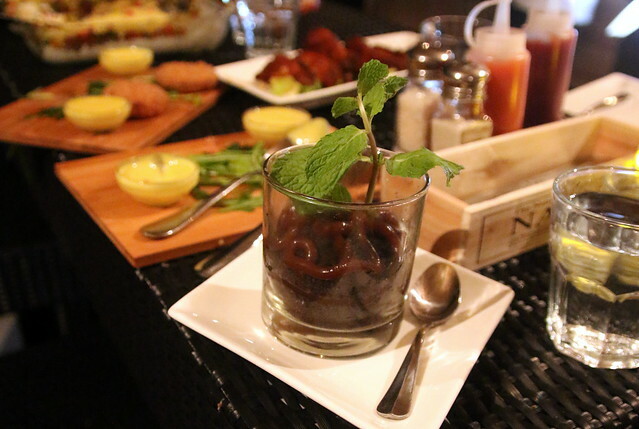 There's lots of tapas-style starters to nibble on, and South American cocktails to imbibe. Oh, plus Cuban cigars too, if you so desire. There's more to look forward to in coming months - they are planning satay and BBQ on the rooftop! Until then, it's bar bites and the same menu as downstairs. 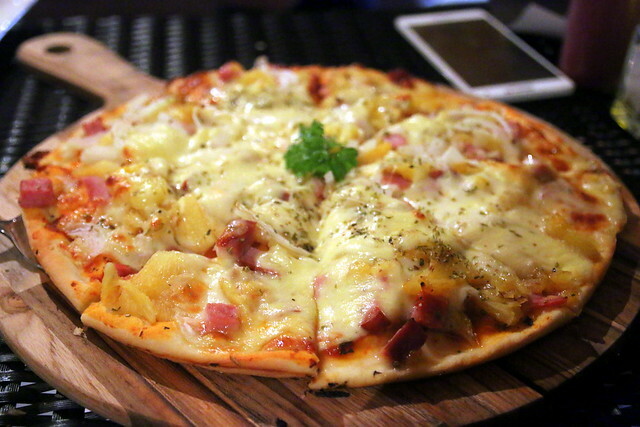 Here's what looks to be a Hawaiian pizza. I think it's better than the Rendang pizza, which proved a little too sweet. 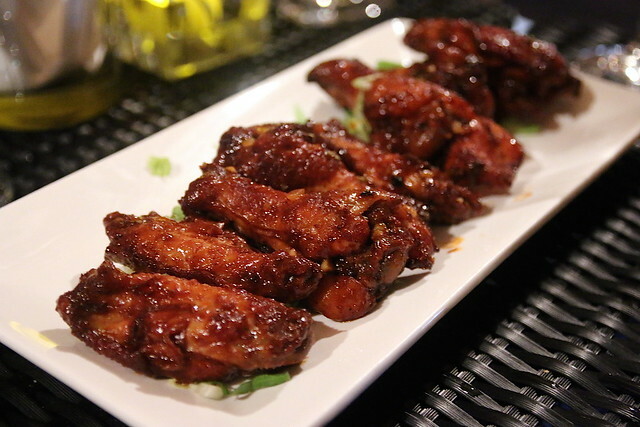 These are the Buffalo Wings with the chili heat severely clipped, much to our disappointment. When we asked, we found out that their clientele could not take spicy food, so they had to tone it down. But what about those who love spicy? I seriously think they should have two versions - namby pamby and DEATH by Chili! The real highlights are the drinks. 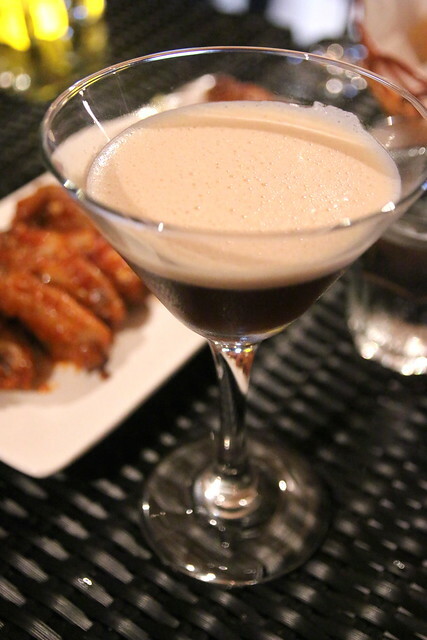 The Kopitini - espresso, creme de cacao, vodka - nice and strong. Caffeine and alcohol together is a potent combination. 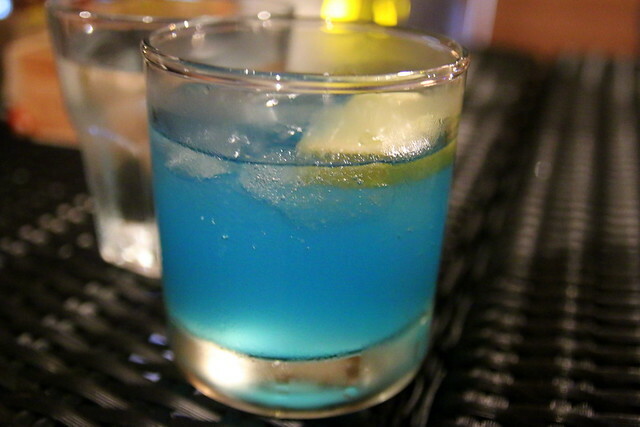 This is "Bokep" which is named after the bartender who created it. It's blue curaçao, sambuca and vodka. The hint of anise from the sambuca gave it a lovely spicy sweetness. Dessert was really fun. 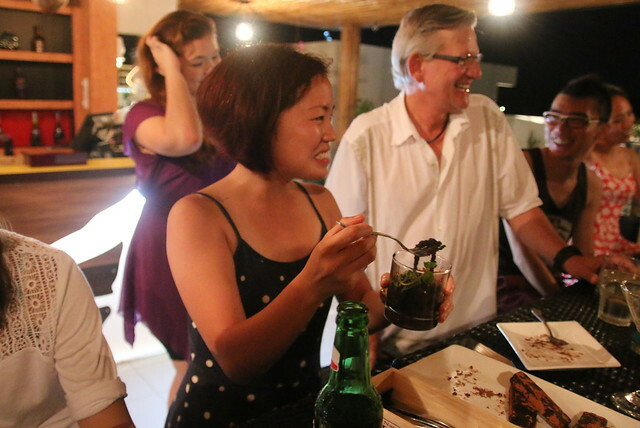 They told us they had specially cultivated some "Bintan worms". These fat and juicy creatures are served directly with the soil they live in. One by one, it took us great courage to swallow the soft, wobbly worms, but once we got past that, we found that they tasted surprisingly good. Poor Gina. She forced the worms down and yelled, "Where got nice?" Oh yes, every one of us had to try them! This is what they look like. Amazing! Best dessert ever. Of course, they aren't really worms, but gelatine noodles in chocolate "soil". The texture of the worms is like firm grass jelly, and the soil is really tasty. Hands down, my favourite dish here, and I am not even a dessert person. 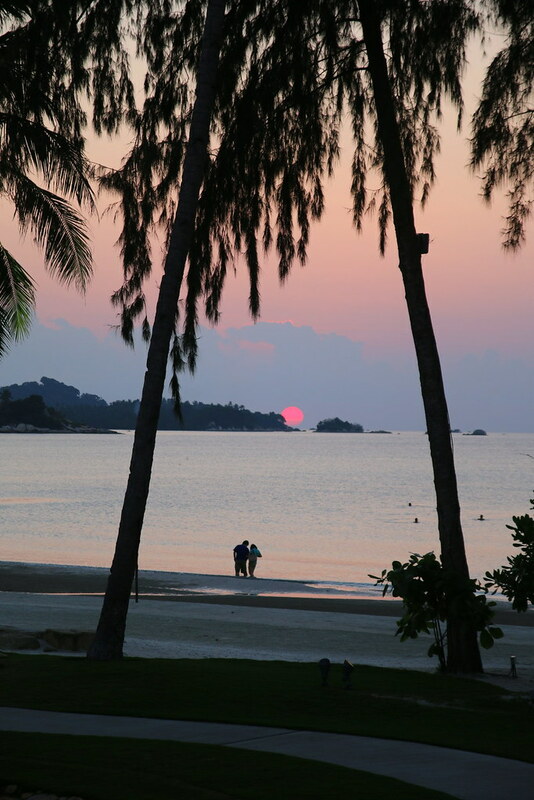 So it looks like we have new options for getaways in Bintan. 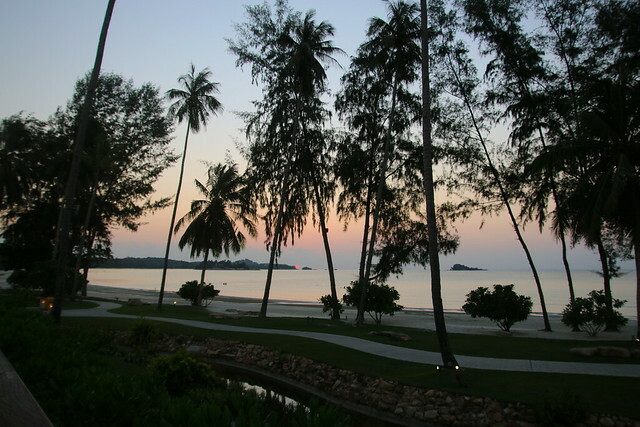 Lagoi Bay itself is a budding resort development in Bintan. Most of it is still "akan datang" but we saw some interesting developments, like Treasure Bay. They are constructing a mini Clarke Quay like dining and entertainment area. A lot of the shops are waiting for each other to open. 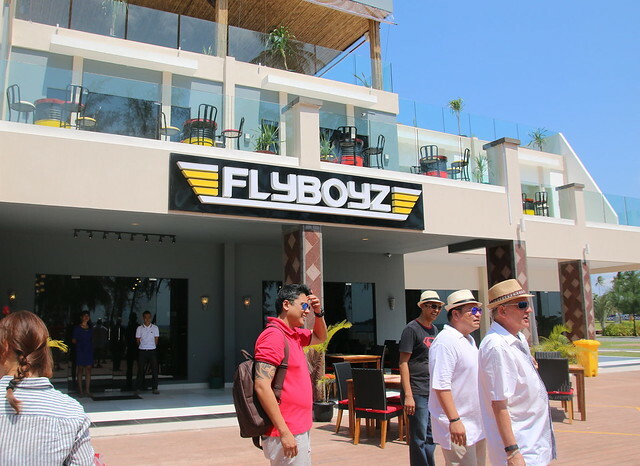 Flyboyz kicks off what hopefully will be a thriving hub at Lagoi Bay. Many thanks to Flyboyz for the invitation and experience!